In todays fast pace market it is important to remain relevant and competitive, using BIM has its obvious advantages for larger architect firms, but what are the benefits for small firms. The pitch, clients of smaller firms are often less familiar with the design processes, so the use of building information modelling can often create a wow factor that both excites and instils confidence in your work. BIM can also be timesaving, in times where altering the designs in CAD meant that there were multiple documents that required alterations, taking longer to do and increasing the chances of human error, BIM recognises the alterations in three-dimension and will adjust and update all of the drawings simultaneously, allowing architects time to focus on other important duties. Client demands for complicated 3D designs can be a hassle for smaller firms so outsourcing has often been the answer. However this can be expensive, with BIM this is no longer a headache and gives the firm a chance to provide the same services those larger companies with 3D modelling capabilities can. BIM is transitioning from a ‘nice to have’ to an essential tool. With government BIM mandates, widespread adoption and increased productivity to increase the software’s capabilities, it is fast becoming an industry standard. With the high level of competitors it is important to keep your name and image relevant. BIM can assist you in providing the relevant imagery and documents to create a stunning portfolio for marketing. Budgets are important for all clients, both large and small in scale, with CAD it was often necessary for clients to have a contingency plan in the event the budget didn’t stretch as was planned, in these cases the relationship between client and firms is often strained. With BIM it is possible to be more accurate in construction documents and therefore more accurately predict costing and build a stronger relationship with the client, making repeat business more likely. BIM software allows its fewer people to perform more in less time. Smaller firms often find themselves competing with larger firms for a project. While using BIM software allows smaller firms to show clients that despite their size they are just as capable of producing high quality sophisticated work. Here at Inkpen Downie we are working hard with BIM, to see some examples of our projects, click here. 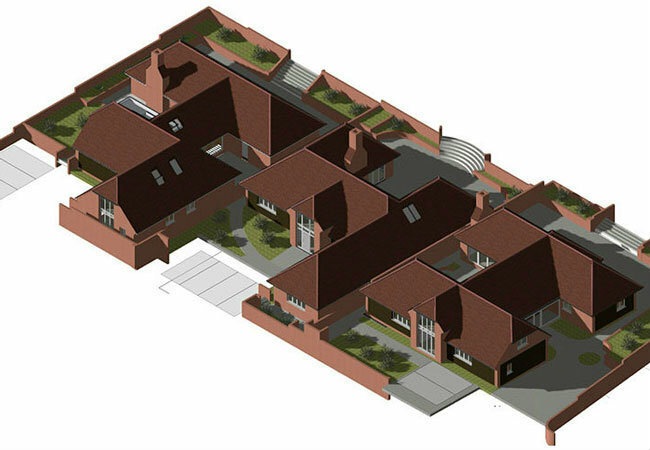 Or to learn more about what Building information modelling, check out our BIM services page.